The purpose of United Church Women is to unite women of the congregation for the total mission of the church and to provide a medium through which they may express their loyalty and devotion to Jesus Christ in Christian witness, study, fellowship and service. Membership is open to any woman who is in sympathy with the Purpose and who is willing to contribute her prayers, gifts, and services for the work of the church in the world. in Christian understanding, faith and experience through worship, bible study and involvement in other activities. in the mission of the United Church in the congregation, the community and the world. financially in supporting the United Church through the M&S Fund and in helping meet the financial needs of the congregation. to committees and boards of the congregation and the Presbyterial UCW. 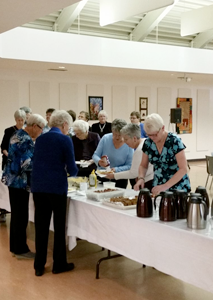 The UCW often are called upon to cater to funeral luncheons, birthday and anniversary teas, and other events within the church auditorium. They do not offer catering outside of the church building. The UCW meet on a monthly basis, on the second Wednesday morning from September to June.